Enjoy this time- it won't last forever! In Australia, January & February are usually the quietest months for businesses. Unseasonably, we hit the ground running in the New Year but I’m sure there will be a few quieter weeks sprinkled throughout the year. Catch up on your bookwork! If you are anything like me, there is always receipts & invoices that need entering into my accounting program. Catching up now will save a lot of work, come tax time or when it’s time to fill out your BAS statements. Make extra stock. If you have a product based business, can you manufacture extra stock that you know will sell in the busier months ahead? Or, alternatively, can you simply cut these products or garments, so they are sitting waiting for you to make up? This is particularly useful if you use scraps for some of your items, as this can be quite time consuming, when you are frantically busy, the week before Christmas! (See tip 2 in my previous blog, on designing products that use scraps). Use this time to design new products, eBooks or courses. It’s amazing how much easier it is for me to design a new dress, when there is no pressure to fulfil a large quantity of orders that must be out by the end of the week. Inspiration flows when all outside pressures are lessened. Of course, thinking that we were going to be slow in the early months of this year, I started writing a trade book for those who sew in their home based business. I only got 30 pages in & then real life got in the way & the orders came in! I will take my own advice & finish this book in some quieter weeks later in the year. Clean up or rearrange your work area. Isn’t it amazing how life gets in the way & the basic “housekeeping” jobs don’t get finished properly when you are busy? I love having a quiet day (Friday afternoons are usually great for me), when I can wipe down all my sewing machines from the fabric dust that has settled over the week, making sure that the next week is off to a good start. This is also a great opportunity to rearrange your home office or work space. Not only is this a chore that has been on your mind (& therefore using up energy), I find that a change is really as good as a holiday, leaving you inspired to work in your new work environment. Side note- a holiday to a tropical island might be even better, but how long is your quiet time?!!! Catch up on social media. Use this time to network & reach new followers. I know when I am super busy, social media is the first thing to be slip off my to-do list. By using this quieter period of time to engage on your social media channels, it buys you a little more grace for when you are busy again. Batch your blog posts. Sit down for a day, morning or even a week, if you’re so inspired & get in front with your blog posts. This will bring some relief for when life steps up a notch again, knowing that you are a few blog posts in front. 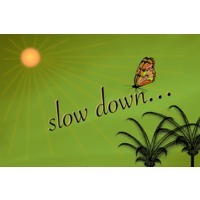 Be kind to yourself & slow down! This is the most important suggestion I can give you. After running my business for 20 years, I have a fair idea of when my busiest times are & when things will slow down. After suffering my share of burnout & exhaustion in the hectic spells, I now really try to slow down & enjoy the slower times, while I have the chance. I knock off work on time, cook casseroles (freezing extra meals for when life gets crazy again) & spend time in my garden & with my family. There is a parable that talks about handing your family a heavy rock to hold for a while but there is only so long your family can hold this rock before it gets too heavy. When my business is super busy, my family always has to step up & take the rock from me, in the form of housework, meals & general day to day running of the home. It’s my responsibility to take my share of this burden back when I am able to do so, in slower, more peaceful times. I hope this inspires you to enjoy the quieter moments in your business. This can be an anxious time, not knowing when work will pick up, but often there isn’t much you can do but ride the waves. If these periods do worry you, why not make a plan to save money in your most financial times, so you have a buffer to enjoy the tiny reprieve you have when life is at a slower pace? Got any tips on what you do in your slower weeks at work- please leave a comment below, I would love to know!